New winter proposition from MAC Cosmetics was developed with the upcoming warm season in mind and they are definitely a great success. With the beginning of this year in shops appeared Retro Matte Liquid Lipcolour collection. How can lipsticks make you want shopping? Retro Matte is a liquid lipstick with matt finish! Timeless elegance is associates with matt make-up, because only matt shades can present beautiful depth of soft colour. Glamour make-up is all about matt lips, which with Retro Matte Liquid Lipcolour should be intense, beautiful and full. Classic at its best only with MAC! Innovative formula form MAC Cosmetics is a liquid lipstick (though in shop you’ll find it with lip glosses), which offers incredible matt finish in fifteen shades. It doesn’t matter which colour you’ll choose, each one of those colours will look great – thanks to creamy and lasting finish it will always look effective. 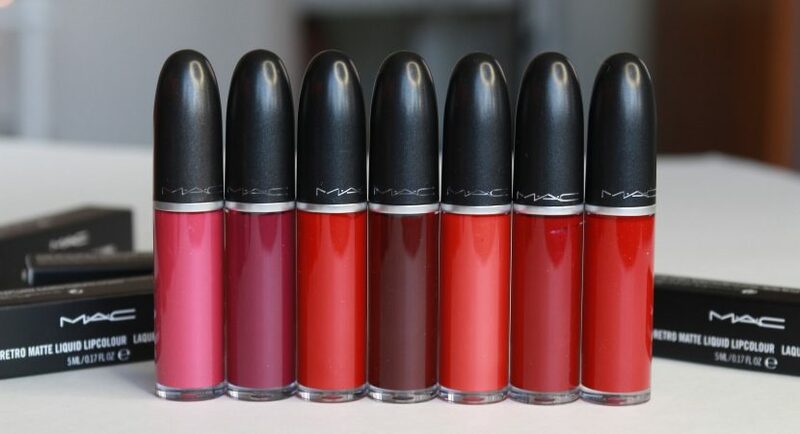 MAC Cosmetics is famous for its long lasting matt lipsticks. Innovative liquid formula of Retro Matte Liquid Lipcolour will hold at least few hours, but those are not all the qualities of it. Consistency of this matt product resembles more of a lip gloss than dry lipstick, but it will allow easy and pleasurable application without dry lips effect.